In historic downtown Russellville, there’s one building that always stands out. It’s so massive that it could never be overlooked. Landscaped with the greenest bushes and trees and featuring countless windows, it’s the most unique building on 209 West Main St. Soon, the building will get a new owner — First Security Bank. Since 2017, First Security Bank has been housed in a more hideaway spot at 2504 West Main Street. The space has been “great for us,” says Jared Wood, market president of First Security Bank in Russellville. But 209 West Main has been on his mind. “As long as I’ve been in Russellville, that’s been an iconic, landmark location,” Jared says. Not only is it a landmark location, but it also has had experience with the busyness and bustle of banking. In the 1970s, the building began as a home for Peoples Bank. “We want to make it our location,” Jared says. 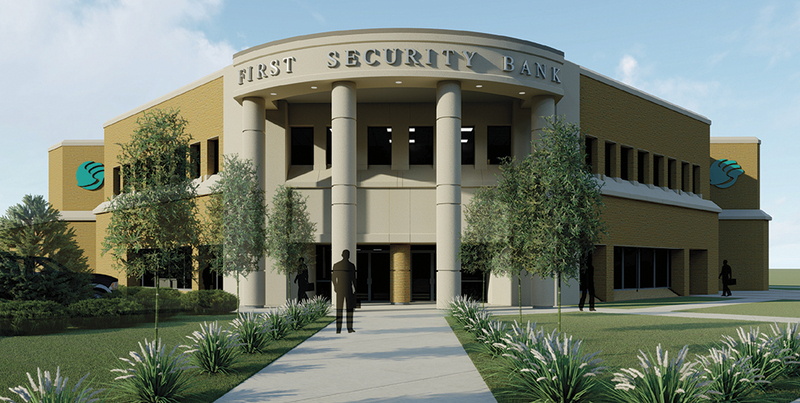 While First Security Bank will receive an updated aesthetic to its brand and an added relevance in the Russellville community, it is truly more about what the change will give to the heart of the bank. And at the heart of a bank, its intent is to care about the people inside. The expansion of First Security will be just about that — becoming a convenience for the people. First Security is the fifth largest state-chartered bank in Arkansas with $1.1 billion in total capital and $5.6 billion in assets. The bank offers services and solutions for financial needs to the public sector, individuals, and businesses within Arkansas. It handles personal and business banking, investments and mortgage loans. In personal banking, First Security offers checking and saving accounts, time deposits that include certificates of deposit and individual retirement accounts, a health savings account and personal and mortgage loans. Personal checking and savings accounts each have their own plans and a variety of options. Checking accounts offer a basic banking plan with the Bank Better Checking, Teal Checking, for customers with higher balances, and 50+ Gold Checking. Personal savings accounts have four plans to choose from: the Money Market Investment, for customers who want to earn interest; Regular Savings, for earning interest with extra funds; Kids Club Savings, for those under 17 looking to save money; and Christmas Club Savings, a plan specifically designed to save for the holidays. Business checking accounts offer small business, commercial and non-profit checking while savings accounts for businesses offer Business Savings and the Business Money Market. The business portion of First Security offers nine different services for cash management and two forms of business loans, including debit and credit cards. First Security’s mortgage loans help first-time home buyers, experienced home buyers, veterans, rural areas, those looking to remodel or refinance, and also offers home equity loans. The bank’s investments are based on trust and wealth management services. The trust services cover estate management and estate planning, living and personal trusts, agencies, escrow services, and court-appointed guardianship. Wealth management deals with investment management, financial and retirement planning and individual retirement accounts. In promoting its services, the visibility aspect is key. The bank prides itself on being homegrown and staying local. This allows First Security to truly know its customer and make decisions based on these relationships. Based in Searcy, AR, the First Security Bank currently maintains visibility across 77 local centers, 100 ATMs and employs over 1,000 people across the state. Its growth permitted a need for a main office; a place where it can grow, expand and better serve the community. The bank plans to do just that on 209 West Main Street in Russellville.